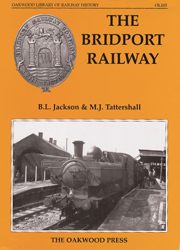 The Bridport branch was 9� miles long from Maiden Newton to Bridport Station, and during its 118 year lifespan it saw many changes. It commenced as a private railway operated by the GWR on the ill-fated broad gauge. An extension to West Bay, it was hoped, would bring prosperity to both the railway company and the local community. Absorbed into the GWR, the line continued through two world wars and into a changing world in which the motor vehicle was eventually to dominate. The Bridport saw it all, and despite being proposed for closure in the 1963 Beeching plan it struggled on for a further twelve years, becoming Dorset’s last passenger branch line to close. As well as a nostalgic look at the line from steam to diesel, the authors have attempted to give an insight into both railway history and railway working, together with a look at the involvement of the staff who operated the branch. The scoial and economic background against which the line traded and survived is also covered. A5 format, 224 pages, over 190 photographs / maps etc.